Fermilab is a U.S. Department of Energy national laboratory for research exploring the fundamental nature of matter and energy. 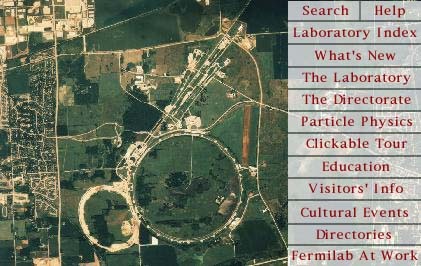 The bird's eye view of Fermilab, above, shows the four-mile circle of the Tevatron, the world's most powerful particle accelerator, and the smaller oval of the Main Injector, a new accelerator that will begin operating in 1999. Particle beamlines reach out from the Tevatron to the northeast. Universities Research Association, Inc. operates Fermilab under contract with the United States Department of Energy.